Unstained, non-endangered zebrawood* is cut into concentric rings and assembled. Hand-sanded and sealed with urethane. 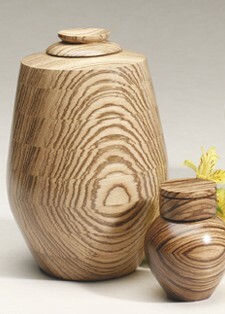 Available in two sizes, urn and keepsake. *Due to the nature of wood, color and woodgrains will vary Closure: Top-opening lid that seals with adhesive (not included) 2.5" Dia. x 3.125"H 2.75 cu. in. Urn Weight: 1 lb.